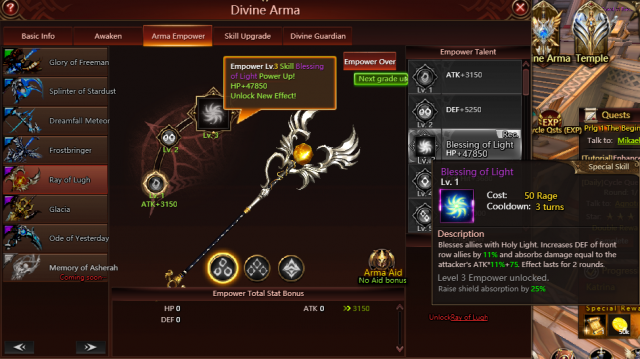 Empower Your Divine Arma to Unlock New Skills! Unleash the power of the Divine Armas! Mystic Domain V, VI and VII are now open in League of Angels III’s update V3.12.0 and a new feature Arma Aid will unlock at level 100. Three Divine Armas, Ray of Lugh, Glacia, and Ode of Yesterday will gain extra skills after being empowered to a certain level. Take a look below for more details. Compared to Normal and Rare Divine Armas, Ray of Lugh, Glacia, and Ode of Yesterday will gain extra skills after being empowered to a certain level. Take Ode of Yesterday as an example, after being empowered to level 3, the Arma that excels in high ATK and damage will raise an ally’s ATK whenever they lose 20% of their maximum HP. It will increase the ATK of the allies’ first strike in each battle and it will always be critical hit after being empowered to level 8. The ATK buff disappears after the first strike and then ATK is reduced by 10% for 2 turns. The crystals and the Divine Arma sigils that are used to empower the Divine Armas can be obtained through Mystic Domain V, VI and VII. Mystic Domain V, VI and VII are guarded by Gloria, Mikaela, and Alecta respectively. 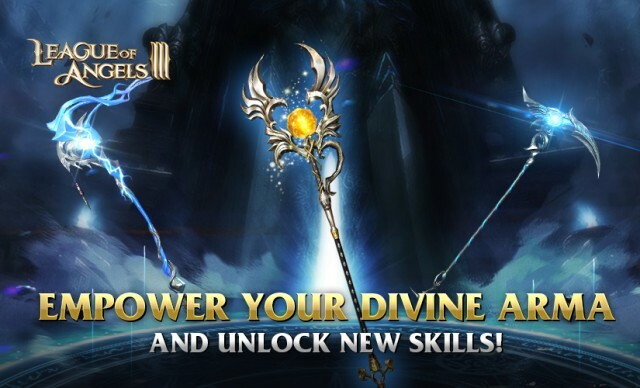 To obtain the materials to empower the Divine Arma, players have to clear the required stages to unlock the next domain. This task is now much more difficult. The first four domains are available every day, however, the newly opened three can only be entered on certain days of the week. Don’t miss out these days to challenge yourself in the domains and claim awesome rewards! Additionally, by clicking on the “Arma Aid” icon on the Divine Arma interface, players can get access to the new features where they can drag a Divine Arma to the Aid slot and get Empower stats. The frenzy for the power of the Divine Armas is continuing on the Grace Continent! Play League of Angels III now either on your browser or on the GTarcade Desktop App. Soaring with Angels, turning the tide!